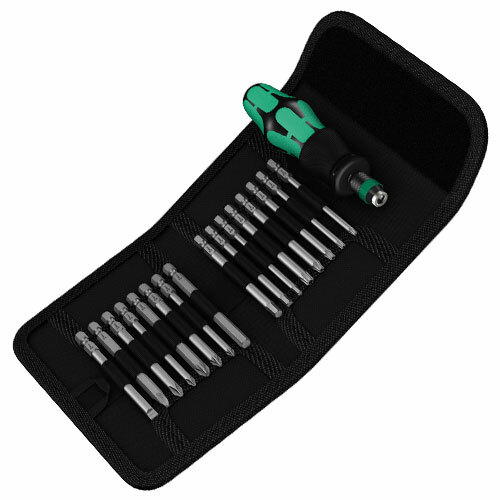 Kraftform Kompakt 60 17 Piece Set with interchangeable bit system allowing rapid exchange of the bits required for a wide range of applications, suitable for both manual & power tool operations. Rapidaptor universal holder holds large and heavy screws securely via the strong permanent magnet. The bit can be pushed into the adaptor without moving the sleeve, the lock is automatically activated as soon as the bit is applied to the screw, securely holding the bit wobble-free. Simply push the sleeve forward to change the bit, the spring mechanism lifts the bit off the magnet, unlocking the tool, so the bit can easily be removed without extra tools. Multi-component Kraftform Plus handle for pleasant, ergonomic working that makes blisters and calluses a thing of the past. Hard gripping zones for high working speeds whereas soft zones ensure high torque transfer. All Kraftform screwdriver handles have a non-roll feature at the lower end, the hexagonal design prevents any annoying rolling away. Impact strength tested at -40°C guaranteeing safety even under extreme conditions. Heaxgon screws can endure a problem as the contact surfaces delivering the power from the conventional tool is transferred to the screw via very small surface areas, as a consequence the screw can be damaged by rounding out. Hex-Plus tools provided a greater contact surface area preventing this from happening. At the same time as much as 20% more torque can be applied and fit into every standard hexagon sochet screw.